Salt Des Freu is a huge nature preserve in Spain. The place is engulfed in velvety green grassland and cascading waterfall. Surrounded by scenic nature, it is packed with panoramic vistas of magnificent mountains. The place offers trails that provide a good opportunity for a decent hike. Enjoy the breathtaking beauty around you and breathe in the fresh air as you walk along the trails. The best time to visit Salt Des Freu is during rainy season. The safest bet for an adventurous weekend, visit this place along with your dear ones to set your heart pumping faster. To personalise your visit to the city, you can use an all-inclusive Bunyola trip planner for the same that will give detailed information about visiting the city. Hotels like Sercotel Hotel ZurbarÃÃƒÂ¡n, Eden Nord and Hotel Miramar will solve your problem of where to stay in Bunyola. Find out how to reach Bunyola to begin with. Plenty of wholesome Bunyola vacation packages are available to choose from, pick your today! Love this? Explore the entire list of places to visit in Bunyola before you plan your trip. Fancy a good night's sleep after a tiring day? Check out where to stay in Bunyola and book an accommodation of your choice. What an amazing place. The waterfalls are a site to see and the water is so clear. Not a long walk to see them but you can walk all the way to Santa Maria if one chooses. 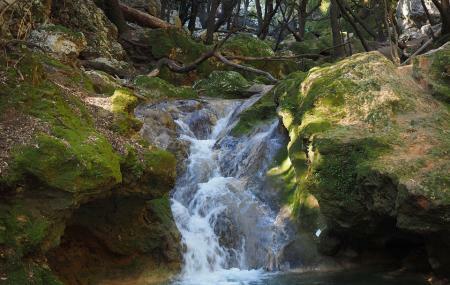 Amazing location, visit after rainfall to enjoy the waterfalls and streams. Although it's not a very long walk you'll be expected to be able to get over two fences with provide ld foot ladders, walk on rocky/cobbled paths and cross a stream, waterproof footwear recommended. There are free roaming sheep on route hence dogs must be kept on leash. Amazing waterfalls that improve with heavy rainfall. There is plenty of parking along the road. Set off down the track and after about 1km you come to a stream. Cross the stream and follow it down and you discover the first waterfall. Beautiful walk, I wish we had gone when there was rain, I imagine that going when it isn't dried up is even more beautiful.